The Kaiser-Franz-Josefs-Höhe owes its name to the Habsburg regent, who visited Carinthia in 1856 with his wife Empress Elisabeth, also known as Sisi. 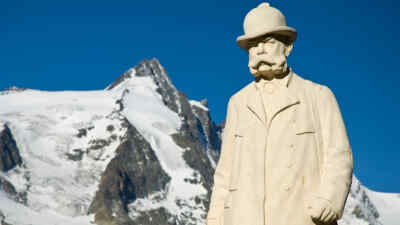 On this occasion, the monarch, a great fan of mountains, went on a hike of several hours from Heiligenblut that led him to the edge of the Glockner glacier Pasterze. 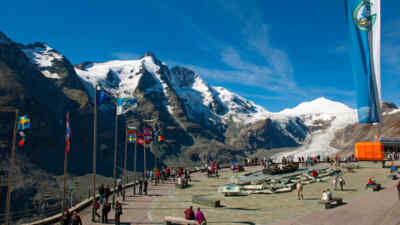 This spot, from which his majesty Franz Joseph marvelled at the 3,798 m Grossglockner, was named after him. Nowadays you can comfortably reach this truly royal vantage point by car, motorbike or bus! 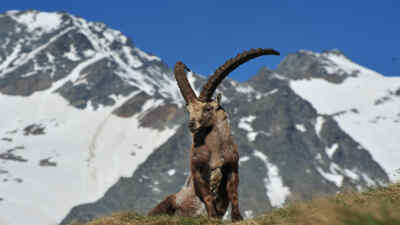 Mountains and glaciers aside, you will also get to see dozens of cute marmots and, if you’re lucky, the mighty ibexes. Park your vehicle in the free parking garage and discover the visitors’ centre with more than 1,000 m² of exhibition space spread across four floors. Here you can learn about the Grossglockner with all your senses: see, feel and hear the world of the high mountains around Austria’s highest mountains! The starting point of the Gamsgrubenweg, which leads high across the Pasterze through several tunnels to the special preservation area at the Wasserfallwinkel, is located on the Kaiser-Franz-Josefs-Höhe. The light, sound and space installations in the tunnel tell the story of the origins of the largest glacier of the Eastern Alps, the Pasterze. The age-old myth gives a good impression of the extent to which humans were at the mercy of the forces of nature and believed in divine fate and punishment. Once you’ve strode through the tunnel, you’ve reached the core zone of the National Park, home of ibexes and the rare Mountain Apollo! Tip: the National Park administration offers free hikes to the Gamsgrube every day at 11 am from early July to September. Information hotline: +43 4824 2700. The starting point of another hiking trails is located above the car park on the Kaiser-Franz-Josefs-Höhe. 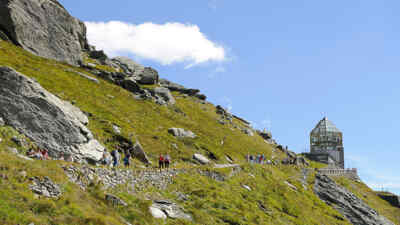 Reach the Wilhelm-Swarovski-Beobachtungswarte named after the sponsor of the High Tauern National Park after a ten-minute walk. The Tyrolean company Swarovski is not only known for its valuable jewellery and figurines made from crystal glass, but also for high-precision optical devices. Enjoy spectacular views using highly modern binoculars allowing you to observe marmots, ibexes and Glockner alpinists up close! Free guided tours from July to September every Thursday at 11 o'clock. +43 4824 2700. 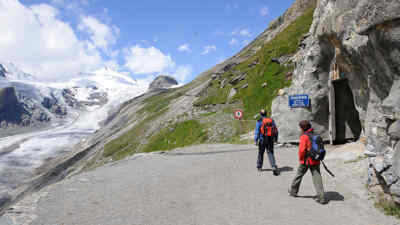 A secure alpine path leads from the Kaiser-Franz-Josefs-Höhe to the Pasterze glacier (walking time to the glacier approx. 30 minutes, ascent from the glacier approx. 1 hour). 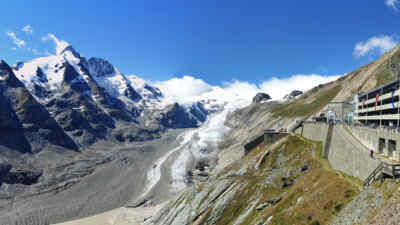 Alternatively, pay for a ride with the glacier railway allowing you to comfortably cover half of the ascent or descent. Having arrived at the glacier tongue, you can start your hike on the Pasterzenewg with its “Stoamandln” via the Magaritzen barrier lake to the Glocknerhaus (walking time approx. 1.5 hours). Tip: take part in a guided tour by the National Park administration for a fee! Every day at 10 am from early July to mid-September, information hotline: +43 4824 2700. You’d like to explore the Pasterze, the visitors’ centre with its exhibitions and the observation deck yourself? Here are all details about the opening hours of the Grossglockner High Alpine Road and the road charges!